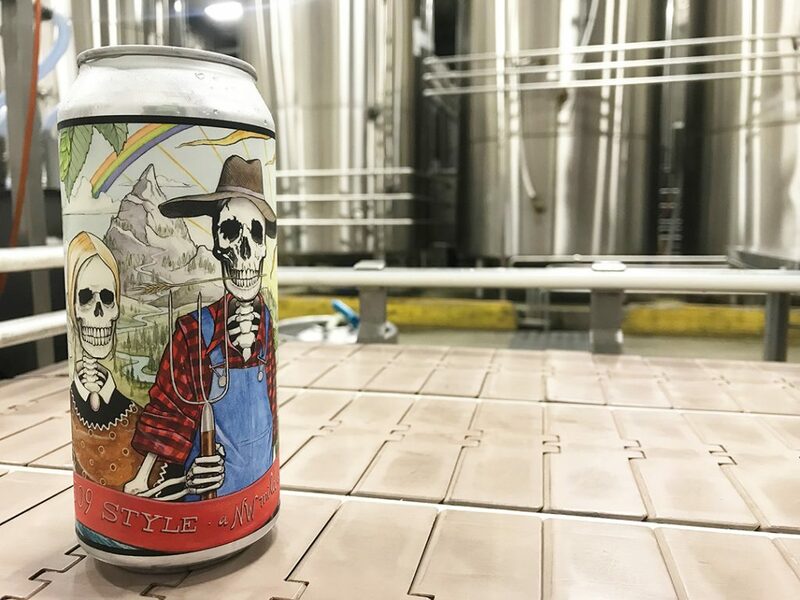 Ellensburg, WA (January 25, 2019) Iron Horse Brewery is announcing its first Artist Series beer label for 16-ounce cans featuring local favorite 509 and artist Justin Gibbens. The beer will be released at [ the pub ] on Feb. 1 during the First Friday Art Walk with the artist on site to discuss his work and sign limited edition prints. The Artist Series will be an ongoing series of beer labels designed by local artists. 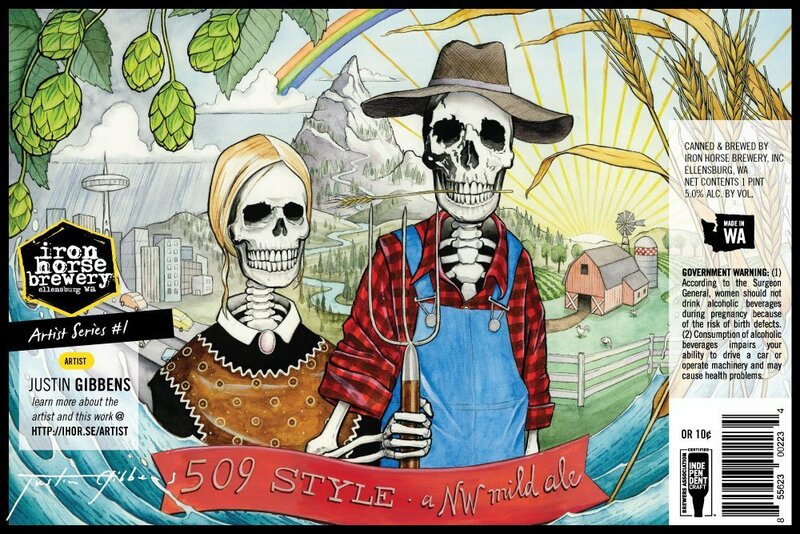 Our first artist from the series is Thorplandian Justin Gibbens, who created a label to represent 509, our American derivation of an English mild ale with an ABV matching its name. Almost a pale ale, this beer is made for the beer drinker who is looking for an easy drinking, balanced intro to craft beer. Gibbens was inspired by American regionalism, specifically Grant Wood’s “American Gothic” painting with two farmers posed in front of their farmhouse, which has relevance to Kittitas County and the 509. 509 will be distributed in both a 4-pack and single 16-ounce can format, available throughout Washington state grocery stores. They also will be available for purchase for $10.99 for the 4-pack at [ the pub ] in Ellensburg. Iron Horse Brewery will be holding an artist and beer release party during the First Friday Art Walk from 5-7 p.m. Feb. 1 at [ the pub ] where you can meet the artist, get his signature on your first can of 509, purchase an original print of the art, drink some of the beer and feel generally uplifted from how creative the whole experience is. A portion of the sales from the prints will go to arts education classes chosen by the artist. To view more work by Justin Gibbens, visit www.justingibbens.com. First Friday artist Stevena House will have her work on display at [ the pub ] for the month of February and will attend the First Friday party. According to her bio, House finds inspiration from nature, sci-fi and fantasy stories, and surreal and activist art. She primarily works with painting, wearable art and 3-D found object collage. Her work may be viewed online at www.stevenahouse.com. 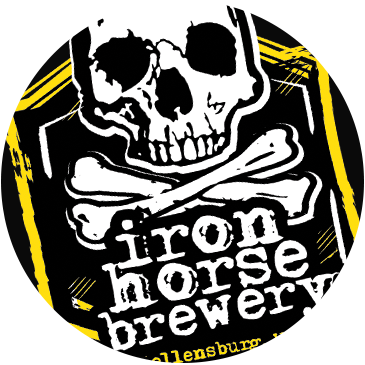 Iron Horse Brewery, centrally located in Ellensburg, WA, has been producing hand crafted ales since 2007. Iron Horse is owned by father-son team Greg and Gary Parker. The brewery has 51 employees and produced just under 27,000 barrels in 2018. To learn more about the brewery or to simply take a break from scrolling through your feed, go to www.ironhorsebrewery.com or watch this video.